I spent just one whirlwind day at the American String Teachers Association (ASTA) convention in Atlanta, but I managed to attend a couple of violin teaching sessions and to check out the showroom full of stuff for strings -- so here's the run-down. Bright and early (6:15 a.m. California time) on Saturday, I attended Patrick Rafferty's sesson on playing unnaccompanied Bach. At first, I wasn't sure about my decision to attend a class on the minutiae of playing Bach before being able to down the full contents of my Starbucks short vanilla latte (for those of you following my attempt to give up coffee, ah, well, um... it was six in the morning), but Rafferty imparted some solid wisdom, like don't hurry chords -- roll 'em slow, baby (he didn't use that exact wording); connect the top note of one chord to the bottom note of the next (as in the G minor Fugue, mm 61-63). Here is my favorite, on how to cope with the physically impossible Bach chord, which usually involves some excruciating contortion of the left fingers over three or more strings. Rafferty's advice: hold the violin like a guitar, and loosen the thumb, letting it fall where it may. Find the chord in this relaxed position, then, keeping fingers in place, raise the fiddle to the chin. "Whatever I have to do with my elbow and wrist, I do that," Rafferty said, demonstrating a somewhat unconventional, but effective, left hand position. When you get to the chord, that's the position you take. It's a little like doing 10ths, when you move your thumb back and let the first finger lie down, changing the hand position just for those notes. He also suggested, for fugues, placing a small silence, but no added time, between fugue subjects, an example being the beginning of the A minor Fugue. "This creates a terraced effect, with each voice sounding more emphatic than the last," he said. He also warned against barreling through the running notes in movements like the B minor Courante double and the E major Preludio. "Bach sometimes writes phrases that aren't easy to see or hear, if you play right through," Rafferty said. "In these cases, it's important to take some time" and to shape the phrases. 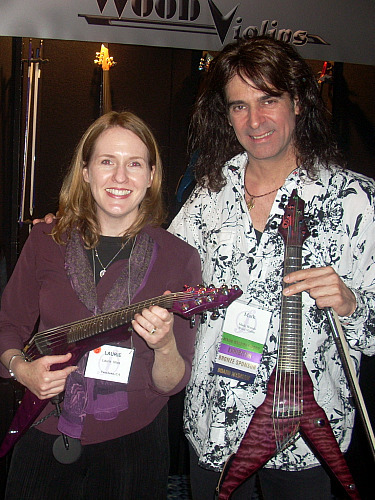 After Rafferty's lecture, I headed downstairs to the exhibition hall, where more than 100 exhibitors were lined up in booths to show show off the latest and greatest in music, instruments, publications, teaching tools and gear for teachers of stringed instruments. Where to start? Barenreiter had its gorgeous Urtext scores on display and had sold out of one of its newest offerings: Kurt Sassmannshaus's new method book for children, The Sassmannshaus Tradition, a revised and Americanized version of his father's method, printed in large type and full of colorful illustrations. (You may recognize Dr. S.'s name from Violinistmasterclass.com). Dr. S. gave a lecture about his method on Friday -- unfortunately I missed it! I hope to catch him doing a similar lecture in Pasadena this June; if so, I'll tell you all about it. A participant, Bill Somach, showed me his new scale book, Accidentals Happen, with 26 kinds of scales (major, minor, modal, augmented, the list goes on) with easy-to-understand explanations of each kind, sort of a "Scalebook for Dummies." A lot of us could use a simple, well-spun explanation of these concepts -- so could our students. 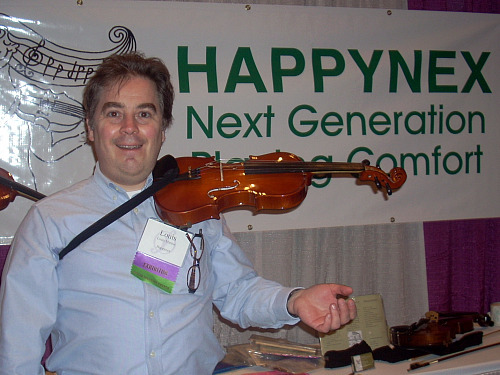 I dropped by Happynex, where Louis Marino showed me the simple sling they've devised to take some of the weight off the violin. Seemed like this could be used for people who have been injured, people who practice long hours and want to prevent back problems, older beginners, etc. Obviously one wants to build up one's musculature for holding the violin, but not to the point of injury. An interesting concept! I was quite happy to see Ariane Todes, editor of the Strad, and even happier when she pointed out to me that I can get 30 percent off a subscription to the Strad (that comes to $75 for a year), and so can all of you, V.commies. Either call 1-866-922-8534 (toll free, so, no, you won't be charged a call to London) or go to this website and, in either case, give them the secret code: STUS09. I tried the website and it didn't work, so you might be better off calling. They're trying to fix the website. In my continual effort to find music my students can play together, I sorted through some string arrangements by Latham Music and got an easy book for two violins called "Anthems of America," arranged by Catherine McMichael, to fan the interests of two of my beginners. They have no group to play with, so why not play with each other? And I just noticed, the arrangement has versions of the second fiddle part in viola and cello, too. Nice! Over at the StringWorks booth, they had their signature King Charles IX Amati Cello reproduction, commissioned by StringWorks President Todd French, on display and available for people to play...I have no idea how it sounds but it's looks amazing! At the Yamaha booth, instruments both acoustic and electrical were on display, as well as information about their upcoming Day of Jazz Violin, to take place right in my own town of Pasadena. I also sampled the very simple BowStopper, a set of colorful clips that one can attach anywhere on the bow so that students must play in a particular part of the bow. As I was trying this out, a teacher standing next to me told a horror story about someone using clothes pins to accomplish the same end -- yikes! I imagined one scraped-up fiddle. The BowStoppers are of a forgiving plastic nature; if the student goes too far, no harm done. Also, bought a Perfect Shoulder Rest to try out on kids. It's a sponge, but it seemed a bit more promising than the purple ones and other makeshift furniture spongewear I've tried over the years. It's impossible to put on wrong (it's rounded at the top, like the fiddle), and this could save quite a lot of time. It also has a non-slip surface that goes against the fiddle. Something for the little ones, I'm thinking. Throughout the convention, young students participated in orchestral and solo competitions, thus many students and their teachers were part of the atmosphere, with performances popping up all over. As I was walking from one side of the convention floor to the next, I noticed this ensemble, the Etowah Youth Symphony Honor Strings of Gadsden, Alabama, with their director, Mike Gagliardo, playing a version of "1234" by Feist (which you may also know as the iPod commercial song). (I didn't catch the beginning, so you may have to listen about 20 second before you'll recognize the tune). In the afternoon, I caught a lecture by Charles Avsharian, founder and CEO of Shar Music, about using Galamian principles in teaching. Once a student of Galamian's at Curtis Institute, Avsharian also produced Master Teacher Series of videos, which show the teaching of Ivan Galamian, Josef Gingold, Donald McInnes and Ruggiero Ricci. It was said that Galamian could make a violinist out of a chair leg, but how can you make a teacher who teaches as well as Galamian? "You teach by analysis, and you coach the creative side," Avsharian said. "I can't teach passion." The trick is to connect the ears to the mind, the eyes to the mind -- and the mind to the hands. "If you don't teach martelé, you don't know how to teach the violin," Avsharian said. "Martelé is absolutely essential to good teaching." It involves four steps: set, finger motion, forearm motion, and the halt. I raised my hand and asked him about students who come to a screeching halt at the end of the martelé stroke, producing an actual sound at the end of the not. He recommended rolling the bow up and off, gently, at the end of the note, to get the mind thinking about completely releasing the pressure. Avsharian also recommended practicing with one's eyes glued to the left hand -- he encouraged people to try practicing this way for a full month. "You are going to see things you never saw before," he said. How fast are your shifts? Which fingers go down, and when? At what point to other fingers pop up? How smooth are bow crossings, how do you achieve the techniques that you achieve? "The only way you're going to improve is if you practice yourself,' Avsharian said. For example, the beginning of the Bach Chaccone: "You all know how to do it, but did you analyze how to do it? Can you teach how to do it?" And that is the question of the day, the reason for the entire occasion. How wonderful to see so many people asking it, and seeking the answer! That was fun to read. Thanks! Thanks a lot, Laurie. You had a busy day! Another latte? I especially like your links and your videos. This is really a fun blog. Also, Laurie, could you please email this to Ray Randall? He has asked about the Strad discount in the past, and he might be interested in this new offer. Yeah for Strad. Great blog Laurie. You were only a few blocks from me - I wish I'd known you were coming and I would have had you over for a glass of wine! I had musician lust because I couldn't justify taking off to attend. It would have been great to meet you, Donna! I did meet a few V.commies, and that was fun, to see people live after this long Internet relationship we all have had! Ann, yes, I'd never heard PR, and I enjoyed what he had to say. Good stuff! You packed a lot into one day, Laurie! Thank you for sharing this great collection of hot links, videos, and memories with us!